Sign up for Broadjam today to follow Field & James, and be notified when they upload new stuff or update their news! 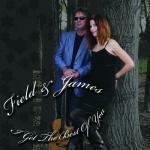 For the acoustic duo, Field & James opposites attract. Singer Field Stark is a classically trained artist while James Eisele is a self-taught guitarist and vocalist. After playing together in the band Vintage Red, the duo began writing and performing original music, classic country and jazz duets. A recent review by writer, Mike Baron in www.popgeekheaven.com says, "James Eisele is one of Southern Wisconsin's more accomplished blues guitarists and has released several albums including 3rd Degree Blues and Blues by Night. Field Stark is a classically trained opera singer. This ain't power pop--it's late night cabaret with close-knit harmonies that can raise goosebumps. Two voices, one guitar. It's intimate stuff that will appeal to folks fans as well as cabaret. Songs like "Road We're On" and "Broken Wing" have an emotional heft sometimes lacking from young power poppers." Their new CD, "I Get The Best Of You," features 14 original songs and was recorded live in Randy Green's studio in less than three hours. The second printing features a lyrics book to accompany the music. The ultra-simple musical backdrop for the two's playful vocal interplay was provided by James and his haunted 12-string guitar, Field's piano and rich harmonies. Cause I'll be in town. Asks my heart "what if" Love has a chance? Will I see you soon? How can I make this last? We wanted to write a duet that reminded us of classic country, like Don Williams and Emmylou Harris with sparse instrumentation. With James' 12-string and a simple string patch on my keyboard, the focus is the harmonies and the lyrics.